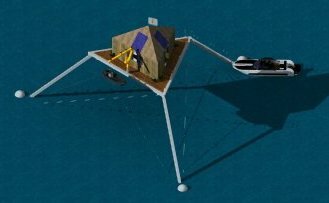 My quadmaran idea is that with 4 legs on a 40 foot container and 4 floats we could have a stable platform. With just the right shape and size floats they and the legs could fit inside the container. So the whole thing could be shipped as one container and then put together. With the right shape floats they can have a soft motion in the waves. With the wide stance, like 40 feet wide and 70 feet long, it would not tip too much or too fast. Could be very comfortable even when moving at slow solar power type speeds. Found a 16 inch styrofoam ball on Amazon. We put the ball in a trash bag on top of some cement in a short bucket to make a mold. We were not that happy with the mold. Putting the ball on a bucket and using a hot wire we cut off 6 sections, leaving a cube. What is left is kind of like a big die. Showing how 4 floats could be fit inside. This box is 40 inches long, so we are modeling at 1:12 scale. And 8 by 9 foot container (higher type) has about 11 foot diagonal. We had 6 nice halfs of floats, which makes 3 floats, but we needed another. Also wanted to test out way to make the right shape for larger models. Maybe half scale or full scale. So edges of hotwire are tied to point on the side of the bucket and we can make 8 inch radius curves like on the 16 inch diameter ball. By rotating the styrofoam and cutting many times we can make a reasonable approximation to the section of a sphere. Something sticking up in the middle so we can rotate foam about it. Discarded foam from first cuts. Cut ends of legs so they fit over sides of box. Then drilled holes through legs and box. Then quicktie to hold together. Box and legs with foam floats in general area to get idea of where we are headed. I used sun hardening resin for the fiberglass. So I set things up the night before and got up a half hour before the sun. Note how nice and smooth the floats were before the resin. The resin has eaten out big pieces of the foam. We tried to patch up foam with spray foam. And painted things. It floats! Put in sand to weigh it down so floats were about halfway in the water. It starts out high in the water so I have my 4 year old put sand inside to weigh it down. Took a bunch of sand but then it is down in the water more. You can get an idea how much sand in this video. You could push sideways on a float and the strings did not go slack, the model just moved sideways. If you slow a video down by the square root of the scaling factor it shows you what waves would act like in the full scale version. So these videos are slowed down.